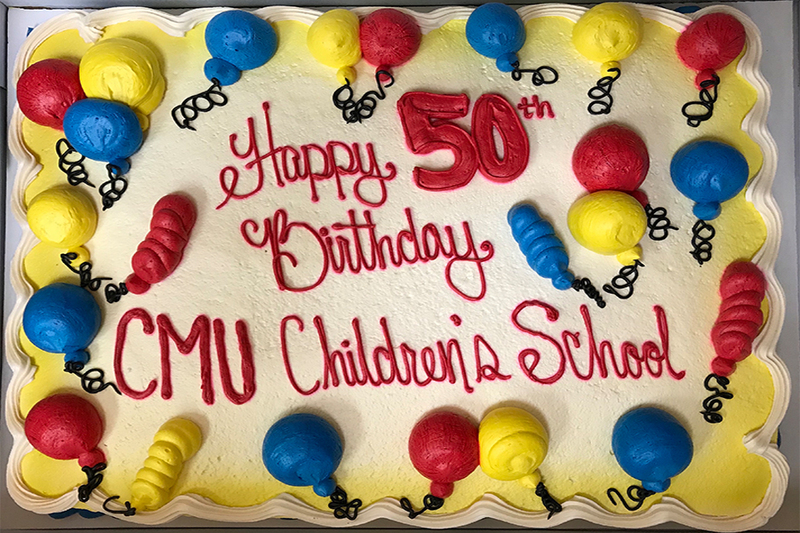 Dietrich College of Humanities and Social Sciences › News › News Stories › 2018 › April › Happy 50th Birthday, CMU Children’s School! 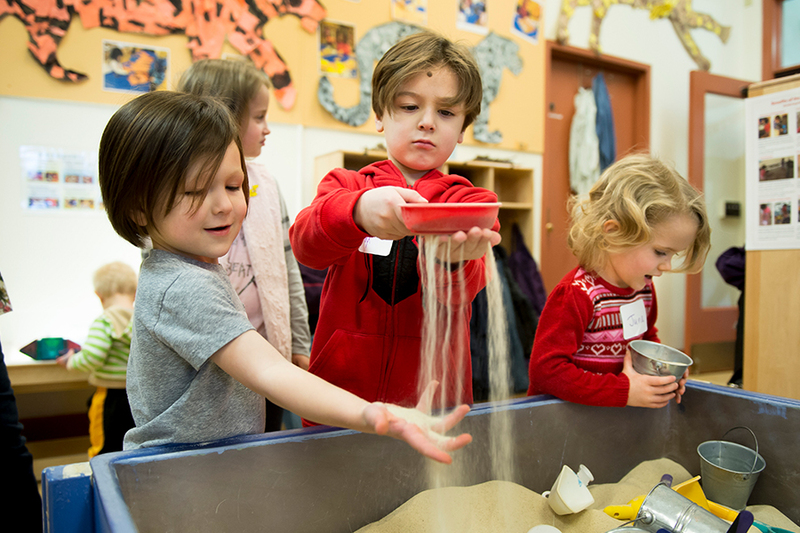 Carnegie Mellon University’s Children’s School has been one of the most sought-after preschools in Pittsburgh for 50 years. 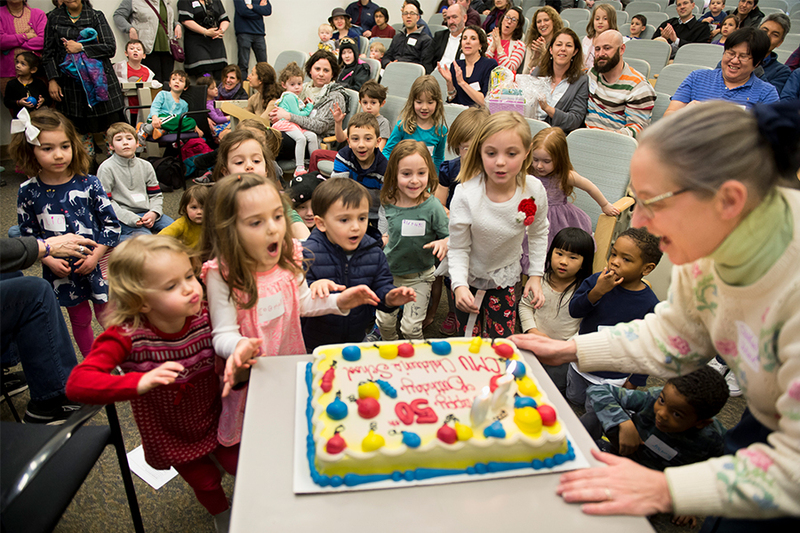 Alumni, faculty, staff, current students and families recently celebrated the university laboratory school with a birthday party. 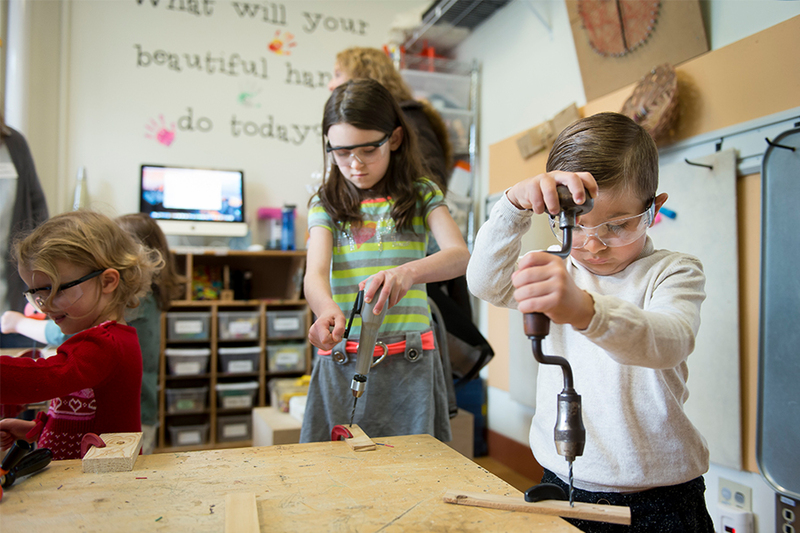 From the start, the Children’s School was based on the teaching philosophies of education reformer John Dewey. 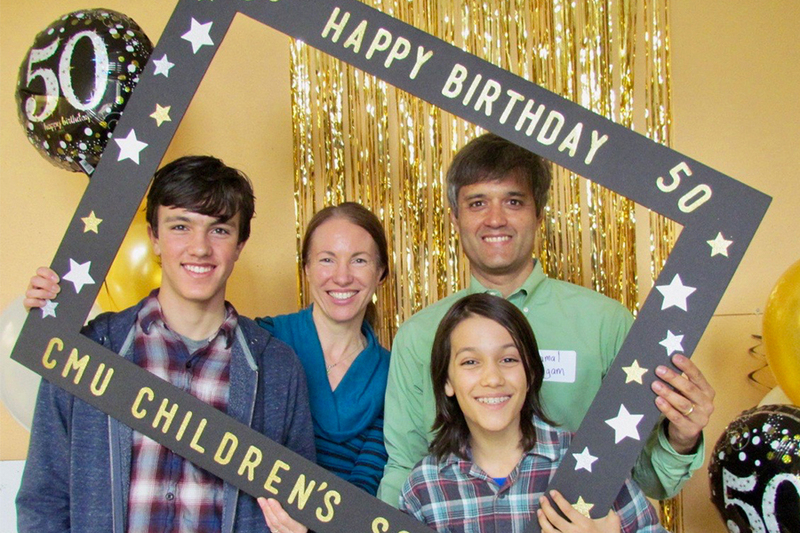 Families with children of all ages, including former students, came to the party. 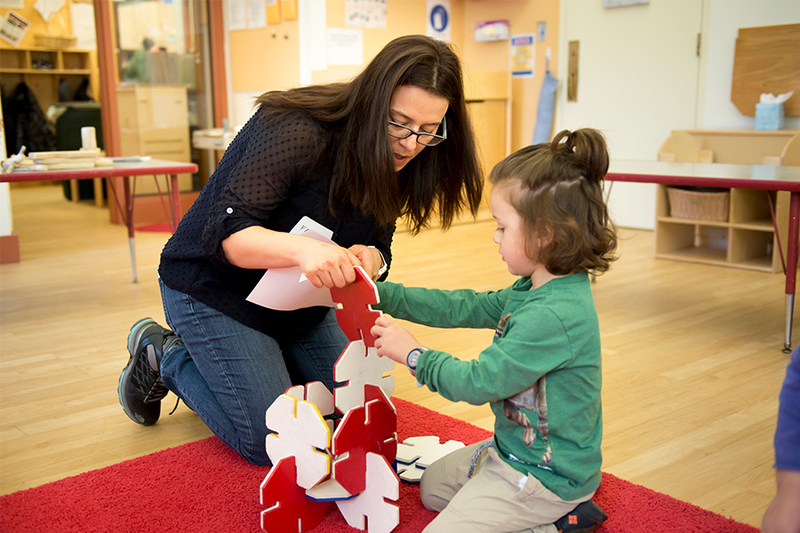 The birthday party gave children the opportunity to enjoy fun school activities with their families, including building with these blocks built by CMU architecture students more than 25 years ago to promote cooperative construction. 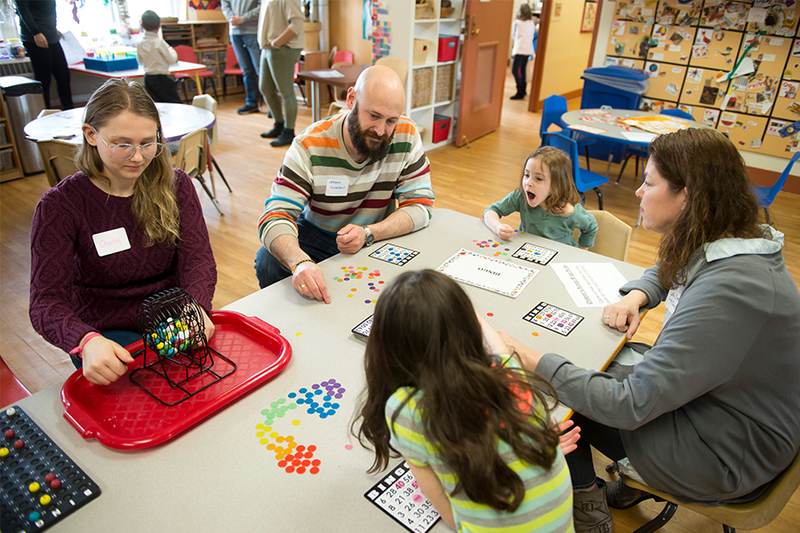 Students from CMU’s Mortar Board Senior Honor Society led a huge variety of party activities that kept families and friends entertained. 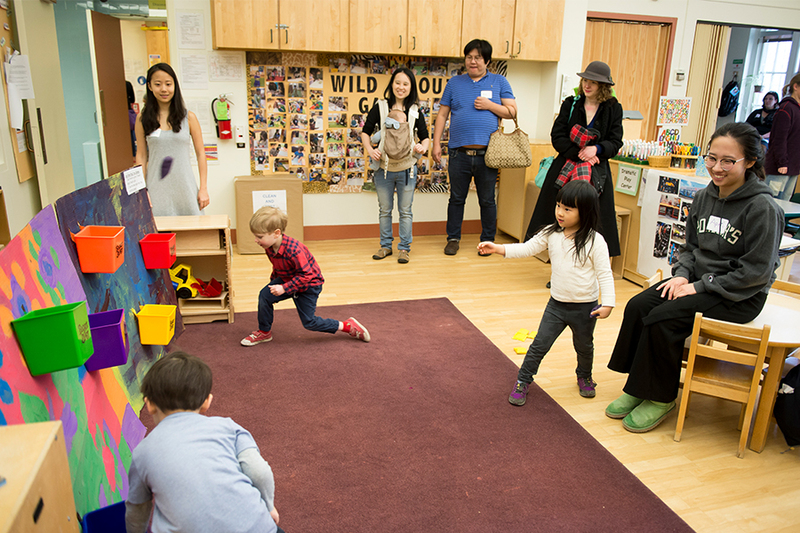 Interactive stations like this sandbox encouraged exploration and discovery. A game of bean bag toss was among the party games. 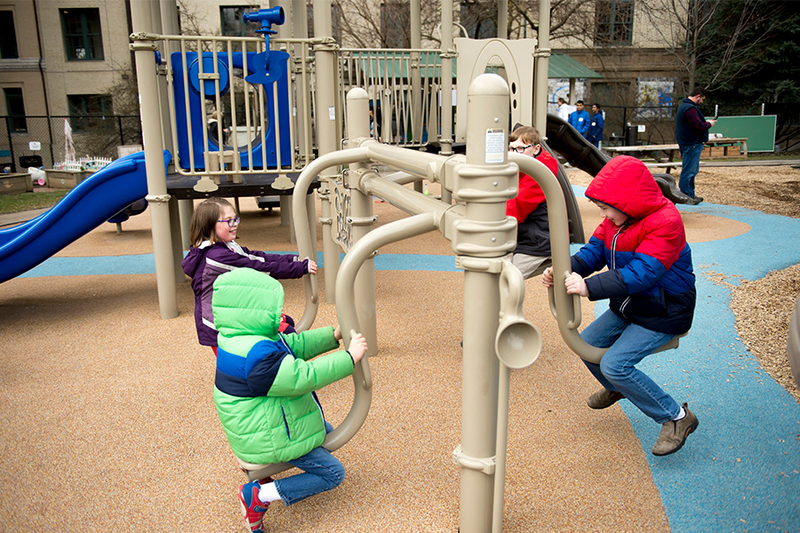 The early April weather was cool but permitted some playtime outdoors. 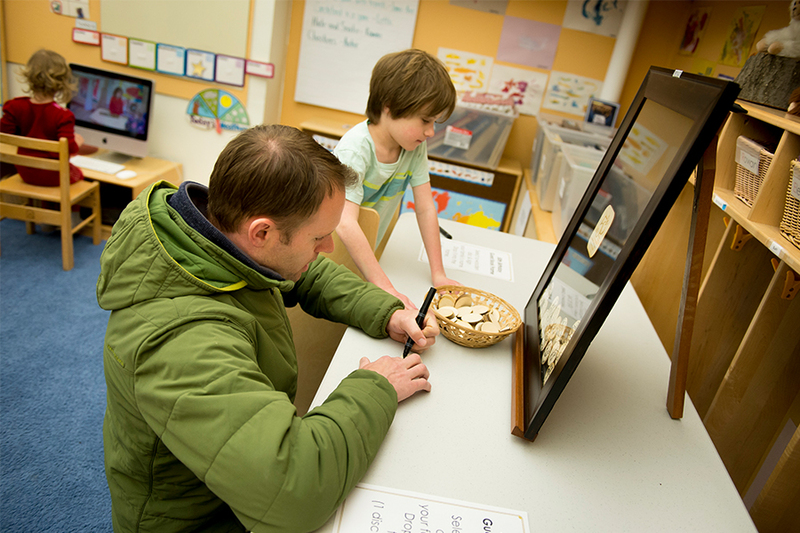 Families could sign a disc and add it to a framed keepsake commemorating the school’s 50th anniversary. The 50th anniversary photo frame shows how families reside at the heart of the school’s history. Everyone in the Nigam family has studied at Carnegie Mellon, with both parents earning graduate degrees here and both sons who attended the Children’s School. There were big smiles all around. 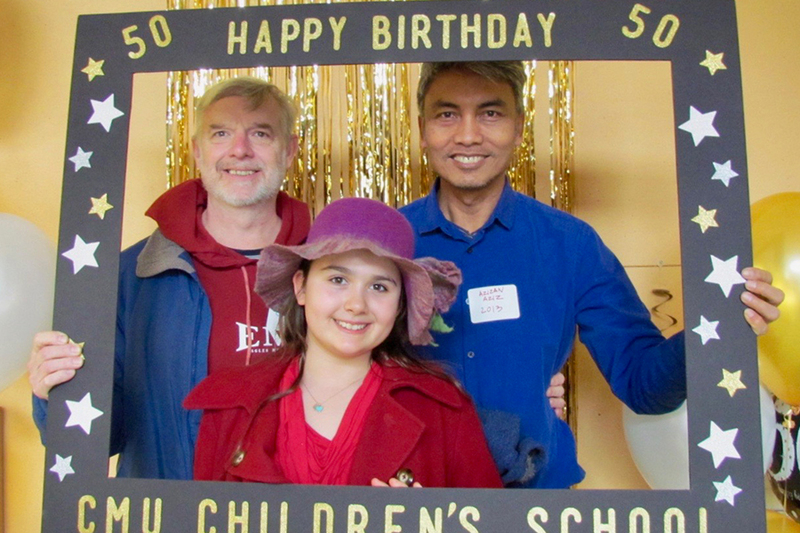 The whole Caton-Aziz family has a connection with CMU, with James in the dance program, Azizan in the architecture department, and their daughter a Children’s School graduate. 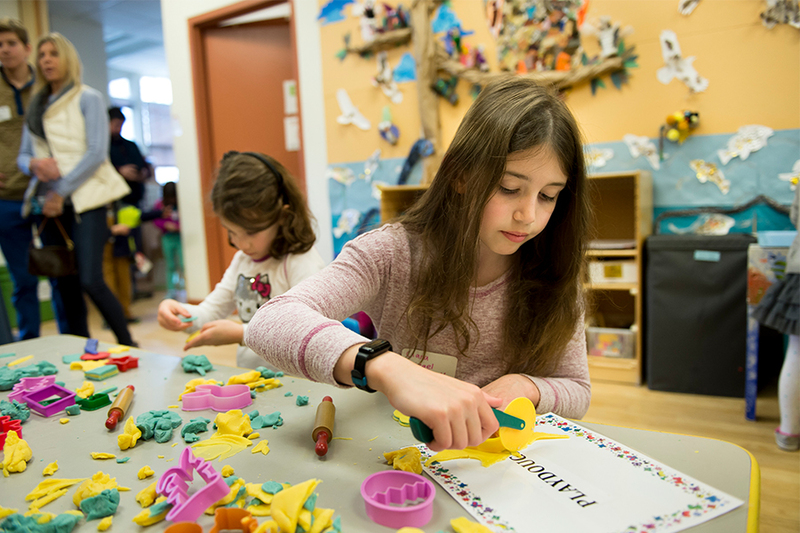 Community families make up about 85 percent of the school’s clientele. 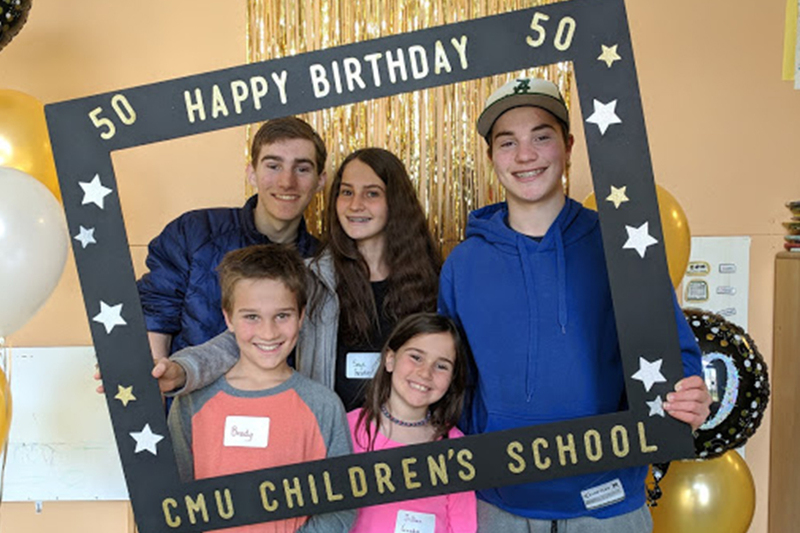 The oldest of the five Grodin children who attended the Children’s School will return as a CMU first year student in computer science this fall. 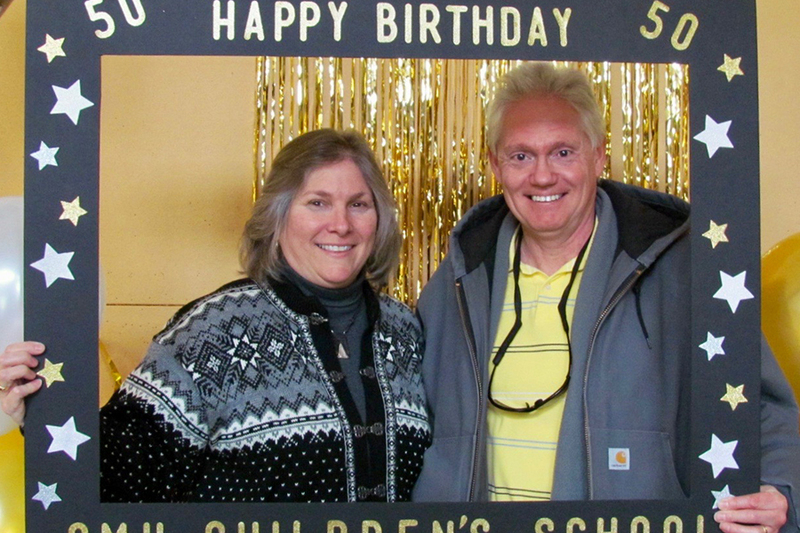 Judy and Ken Hallinen, both CMU employees, sent their two daughters to the Children’s School and later to CMU. Judy was a work-study at the Children's School from 1980-1983 and an instructor from 1984-1992. 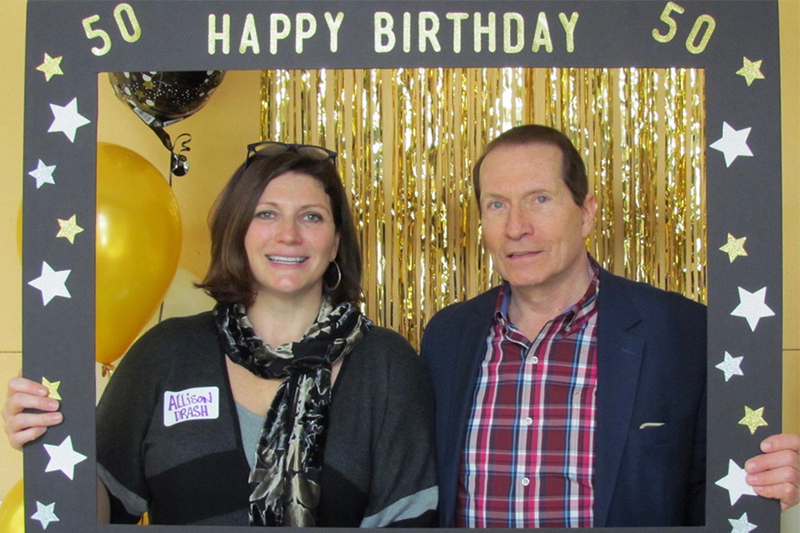 Allison Drash, the school’s administrative coordinator, attended the Children’s School herself and is pictured here with one of her preschool teachers, Bob Skena. 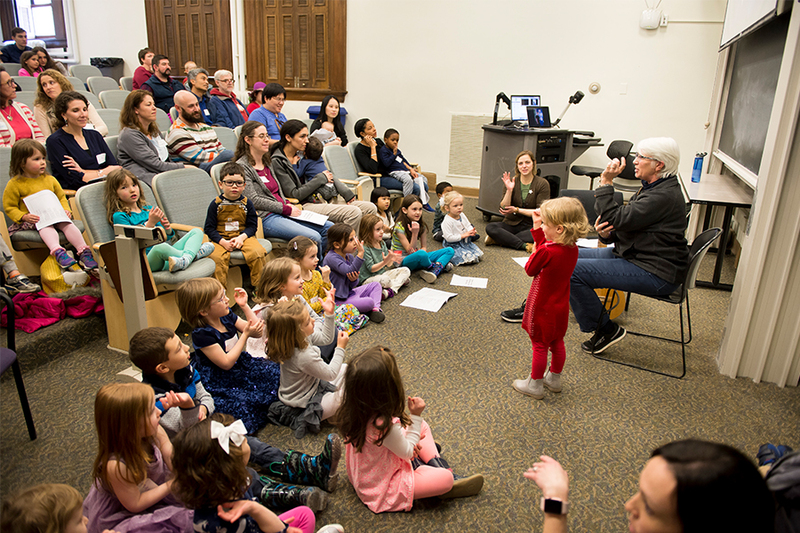 Everyone came together to sing with Jean Bird, who has been sharing her musical gifts at the Children’s School for over 30 years. 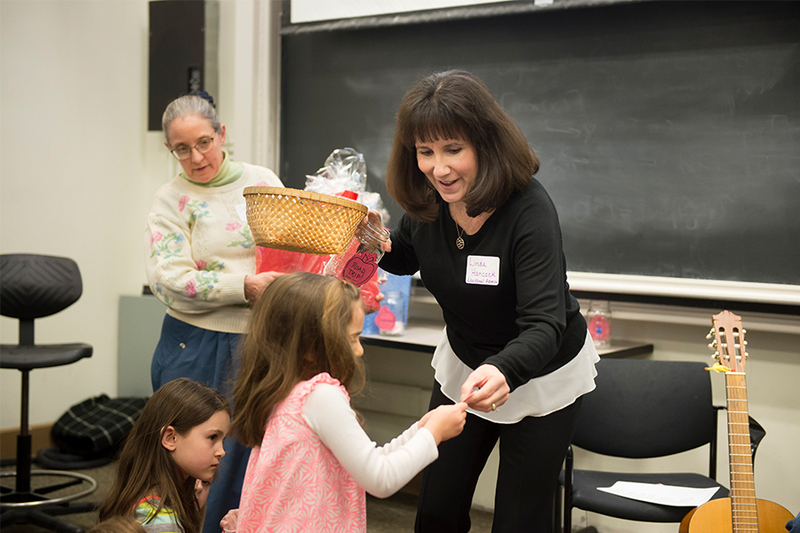 Linda Hancock, another 30-year veteran at the Children’s School, announced raffle prizes. The children were eager to blow out the candles, alongside Children’s School Director Sharon Carver.